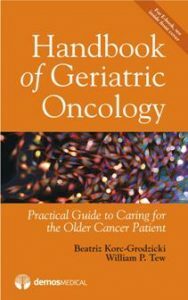 Handbook of Geriatric Oncology is a practical resource for oncologists and related clinicians who want to provide comprehensive, patient-centered care to the elderly cancer patient. Divided into nine succinct sections, it includes topics spanning an Overview of Geriatric Oncology and Aging, Geriatric Syndromes, Geriatric Assessment, Select Cancers Commonly Diagnosed in the Elderly, Communication with the Older Cancer Patient, the Nursing Home Patient with Cancer, Models of Care and Survivorship, Palliative Care, and Integrative Medicine. Complex issues such as the physiologic changes of aging and their effect on cancer, corresponding social and psychological aspects that accompany aging and a cancer diagnosis, assessment of frailty, managing comorbid conditions and diseases, effective communication among healthcare providers, the patient and caregivers, as well as the risks and benefits of cancer screening, are made simpler with helpful clinical guidance and clinical pearls. Spearheaded by world experts in geriatric oncology from Memorial Sloan Kettering Cancer Center in New York, this book is the definitive resource for oncologists and related clinicians to meet the demands of clinical management along the continuum of geriatric cancer care. – Provides best practices for evaluating geriatric syndromes such as functional dependency, falls, cognitive impairment and dementia, delirium, depression and anxiety, social isolation as well as syndromes related to nutrition, comorbid conditions, and polypharmacy. – Discusses unique factors associated with breast cancer, prostate cancer, colorectal cancer, lung cancer, ovarian cancer, bladder cancer, pancreatic cancer, head and neck cancers, and myelodysplastic syndromes in the elderly that impact care plans and treatment.